This is about how useful the fiction section in my local library is. Cool illustration btw. 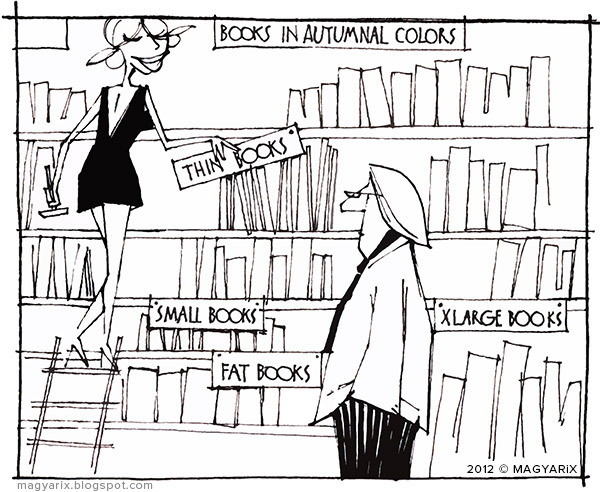 Haha good illo...Its probably the most spaciously economical way to store books..."you'll probably find it in the autumnal colors section sir!" Bookstore for the interior designer! Great illustration. I love your figure drawing sketches btw! Haha! I love your drawing style. This is a great idea and very funny! I love the layout, young lady. I could just LOOK all day.